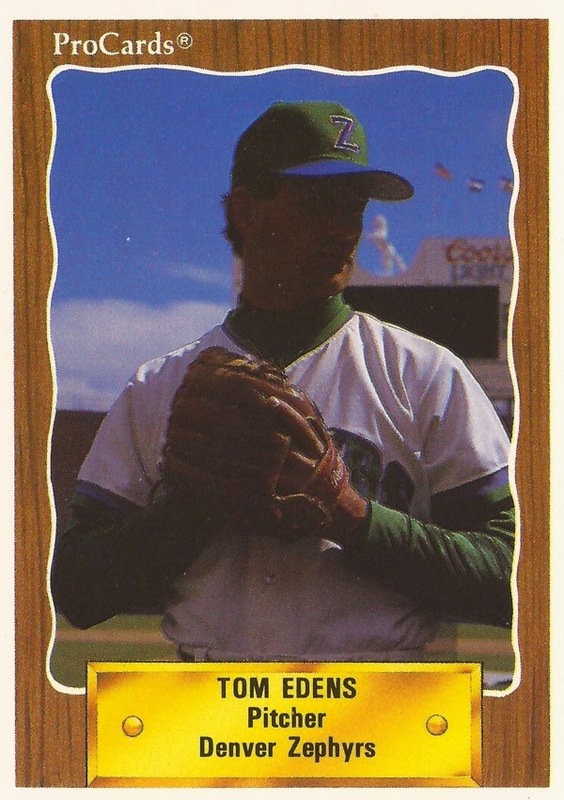 Tom Edens went four innings, didn't give up a run. Still, his manager at Tidewater Mike Cubbage took him aside, The New York Times wrote: Did Edens want to go back out to get the win? Or did he want to come out right then and pitch his next start in the bigs? "I said I wanted to do both," Edens told The Times before his big-league debut. "But he'd made me an offer I could not refuse." Edens made the Mets that year, getting two starts. He also gave up six earned runs in eight innings of work. Edens went on to pitch in a total of seven seasons in the majors, his second, though, didn't come until 1990, with the Brewers. Edens' career began in 1983, taken by the Royals in the 14th round of the draft out of Lewis-Clark State College. He stayed with the Royals for one season, before being traded to the Mets. With the Mets, Edens made AA Jackson in 1986, then AAA Tidewater that same year. After his brief stop in Queens in 1987, Edens stayed in the Mets system into 1989, before being traded again, this time to the Phillies. Edens was the player to be named in the deal that sent Lenny Dykstra deal. For 1990, Edens signed with the Brewers. After starting at AAA Denver, Edens came up for 35 outings, starting nine games. Edens went 4-5, with a 4.45 ERA. He got his second start Aug. 20, going 5.2 innings. "Coming out of the bullpen I know I'm there for three innings and I can let it go," Edens told The Associated Press after that August game. "When you start you're trying to go six or seven and you've got to pace yourself." For 1991, Edens signed with the Twins, getting eight appearances and six starts while posting an ERA of 4.09. He returned to Minnesota for 1992, getting 52 relief appearances, posting an ERA of 2.83. He picked up a save June 21, throwing three shutout innings against the Mariners, coming into the seventh in a jam. The save was one of three Edens got on the year. It was part of a personal Edens streak of 30.2 innings in 19 outings where Edens' ERA totaled a paltry 0.59, The AP wrote. "He got out of the mess in the seventh, pitched a nice eighth and a really great ninth," Twins manager Tom Kelly told The AP after that outing. "Edens is doing a fine job." His season in 1992, though, wasn't enough for the Twins to protect him in that November's expansion draft, but it was enough to get noticed. Selected by the Marlins, Florida immediately sent Edens to the Astros in a trade. The same day as Edens went on the virtual trip from Minneapolis to Miami to Houston, his wife told him she was pregnant. "Looking back," Edens told The South Florida Sun Sentinel the next March, "the baby is the thing that sticks in my mind the most about that day." Edens went on to pitch in parts of three more seasons in the majors, 38 games with the Astros in 1993, another 42 with the Astros and Phillies in 1994 and five to end his big league career with the Cubs in 1995. After his playing days ended, Edens moved on to coaching, serving as pitching coach for short-season Portland and single-A Asheville. Years later, in 2002, Edens' hometown Lewiston Morning Journal asked Edens what his most memorable moment in the majors was. It was his debut in the majors, Edens responded. It was a debut, Edens told The Morning Journal, that he'd never thought he'd see. A veteran of four minor league seasons to that point, he didn't see himself playing in the majors. "I was only up for 13 days and then they sent me back down and I was back in AAA for another two years," Edens told The Morning Journal. "But it wasn't until I was in the big leagues that I thought I might belong there."